One of my favorite challenge sites is having a DT call. Please be sure to check them out! You have to pick 3 favorite creations to submit for the DT call - it was hard to pic three! Please scroll down for mine. Sadly, the Sundae Girls will be saying good-bye to Carla and Jenny after spending six wonderful months together. We have enjoyed their creations, their support, and the lovely comments they have left for participants. Best Wishes to Carla and Jenny. What cute critters! 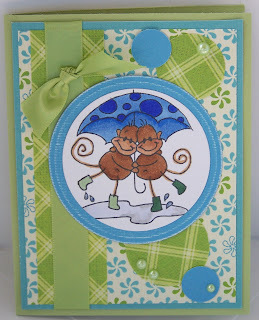 Thank you for taking the time to enter the Paper Sundaes DT call. Good Luck! Good Luck on the DT Call!! Your cards are fabulous! 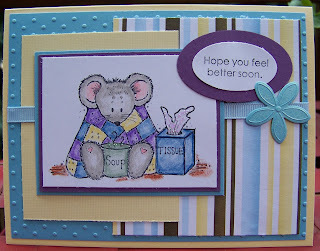 Awesome cards, cuper cute. Good luck on the DT. Hugs, Nataliya. Good luck on the DT call... Your cards are just so cute... 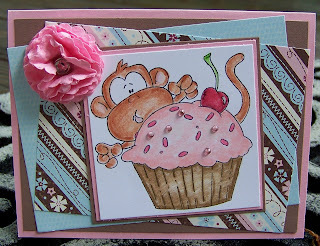 I'm jeleous of that Monkey's cupcake... Looks Delish ! Good luck chica!! Keeping my fingers crossed for you!